One of Buhot’s most widely collected prints, 'L’hiver à Paris', here in its first published state (iv of 9 states) with the title 'L’Art' which appears in the snowbank under the lamp-post at the lower left, and the address of the printer Salmon below the image, but before the extensive reworking on the dogs, and before highlights were streaked into the aquatint, which can been seen on the Gallery’s impression of the same print (acc no 96.2012; v of 9 states). 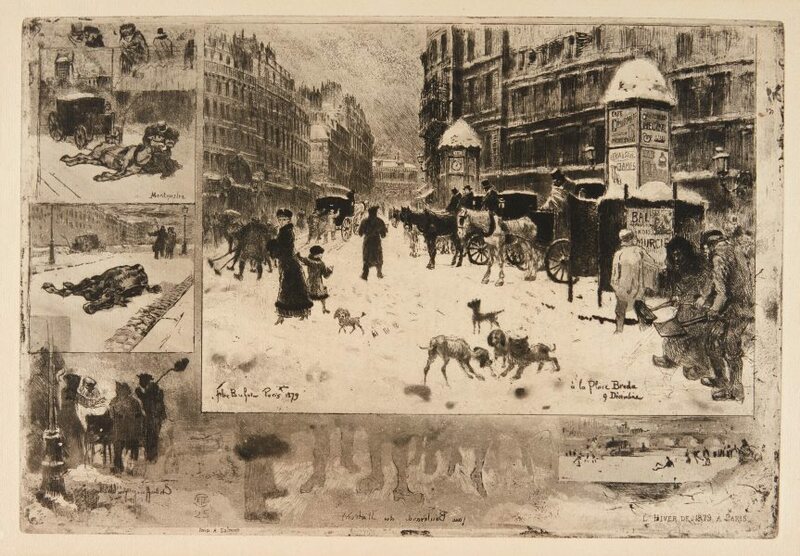 While the central image is of dogs and shoppers only slightly inconvenienced by the weather, by contrast, the margins detail the hardships and suffering brought on by heavy snows. A distinctive and highly attractive feature of Buhot’s prints is the use of marginal sketches to surround the central image. Buhot termed these 'marges épisodiques' and 'marges symphoniques'; the former type relating in theme to the main image, the latter type serving as purely decorative embellishments. Signed and dated, l.l. [inner boarder of central image], [incised plate] "Félix Buhot Paris Xbre 1879". Signed l.l., [incised plate] "FB [monogram]". Annandale Galleries, 1989, Sydney/New South Wales/Australia, Anne Gregory bought the print in auction, Drouot Paris in Sept-Nov 1989 and sold it to the present owner soon after. Les graveurs du XIXe siècle , Paris, 1885-1892, vol 4 (1886), p 32, no 128. Félix Buhot. Catalogue descriptif de son oeuvre grave , 1979, pp 77–78, no 128. Félix Buhot peintre-graveur, prints, drawings, and paintings , Baltimore, 1983, p 101, no 60a.